Happy Meal and I were at Legoland to celebrate the weekend of his 10th birthday. We had driven past Burger House in the past while scoping out breakfast spots in Oceanside, but we had never been in the vicinity at dinner time. Before heading over, I looked up "burgers Oceanside, CA." This search revealed that the local Yelp favorite was Ty's Burger House. Since Burger House shared the same address as the establishment reviewed on Yelp, I assumed that there had been a name change. On a Sunday evening, street parking was free and plentiful. The menu featured a variety of game meat burgers such as elk, kangaroo, wild boar. and venison. We lined up, placed our orders, and waited for about 15 minutes for our burgers to arrive. Happy Meal ordered the standard, 1/3 pound Classic Burger (cheeseburger), and I ordered the 1/3 pound Newman Open Range grass-fed beef burger. I asked the manager/owner about the cuts of beef used, but he had no idea. He told me that all of the other burgers were Chuck, but this was suspect considering that a kangaroo shoulder is relatively tiny. A later web search did not turn up a Newman Open Range purveyor , so it seemed safe to guess that this was probably a Niman Ranch product. The Beef: Happy Meal's Classic Burger was only mildly beefy. The fat content passed 25% with gusto--the bite was oily. The grind was coarse, and the mouth feel was firm. The Classic Burger was average. My Newman Open Range burger was beefy in flavor. The funk of aging was strong in flavor and aroma. It seemed that the beef had been dry-aged. The fat content was about 20%. The grind was very coarse and somewhat inconsistent. Some bites were only partially ground. The bite was rubbery/chewy. I couldn't quite make out if this was due to the large amount of connective tissue in the Chuck, over-manipulation of the ground beef, or if the beef had been frozen. The beef was moist, so it seemed fair to guess that if had probably not been frozen. The beef was lacking in any notes other than beef, so Chuck was the cut. 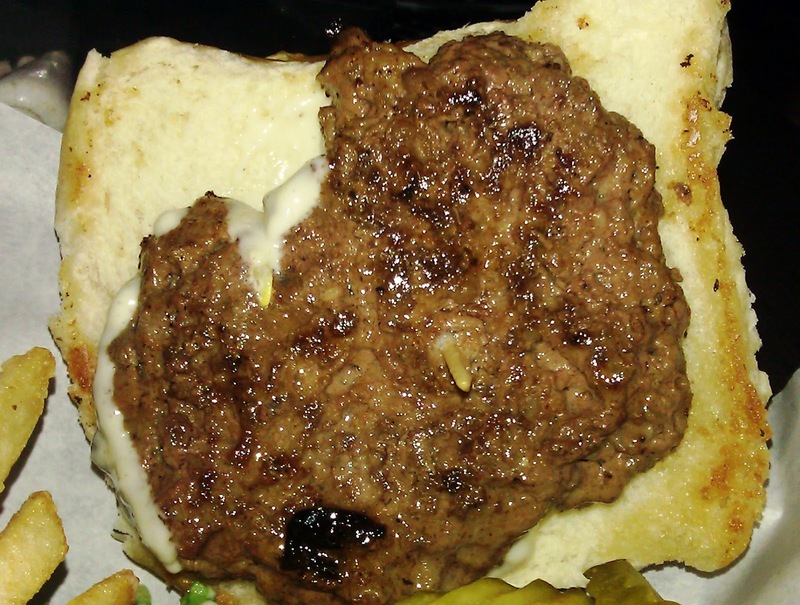 The beef in the Newman Open Range burger was only two notes, but it was above average in flavor. The Seasoning: There was none. 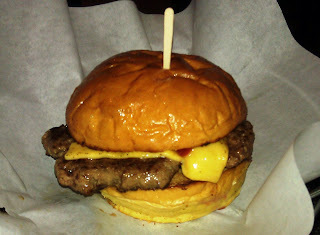 The Sear: The sear on the irregular patty of the Classic Burger was meager. 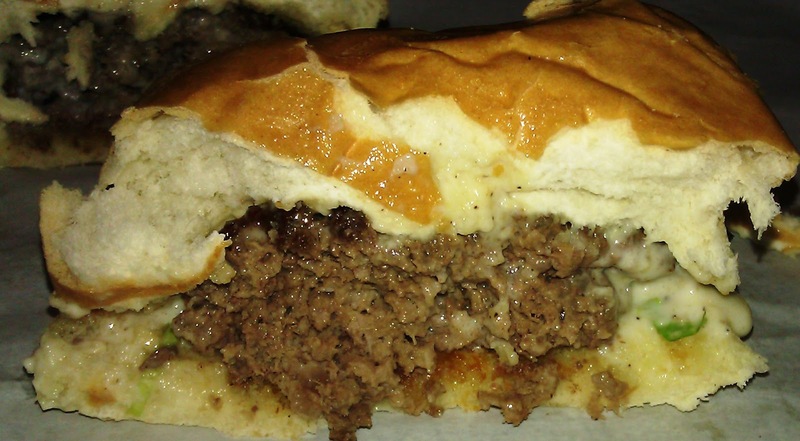 The sear on my Newman Open Range burger was weak. I found that frustrating, because I ordered my burger to be cooked Medium. Instead, I got a Well-Done burger with a crappy sear. Lose-lose. I didn't want to wait an additional 15 minutes for a re-fire that would have gotten me to the half-assed sear of the other burger, so I dealt with it. The Preparation: The irregular burger patties at Burger House were hand-formed and firmly packed. As I have already stated, my burger was over-cooked and a little chewy. Happy Meal's burger came out Medium. I found that comical, because I did not specify the temperature of his burger...irony. The problem here was that the kitchen found themselves overwhelmed with a mini-rush. Rather than pacing the orders and communicating longer wait times, the staff chose to continue jamming burger patties onto a tightly-packed grill that couldn't maintain a proper surface temperature. I would have gladly waiting a little longer for a properly seared, seasoned, and cooked burger. The Cheese: The Classic Burger came with a nicely melted slice of American Cheese. 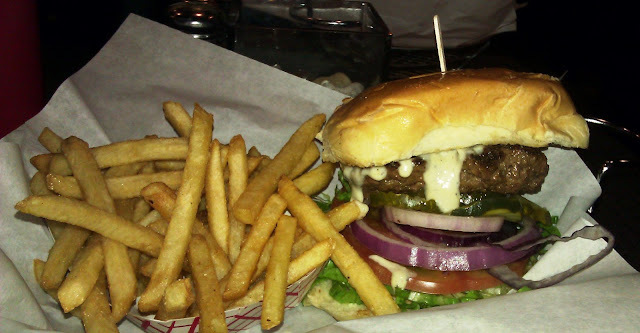 The American Cheese did all of the things that American Cheese should do on a cheeseburger. My burger did not come with cheese. The strong funk and overt chewiness of my burger would have crushed any cheese but Bleu, so the absence of cheese was not noted. The Bun: The burger buns at Burger House were delivered by a local bakery, but the name of that bakery was kept secret--I did ask. The buns were sweet, dense, fresh, and moist. These resembled a dense version of King's Hawaiian Bread. The buns compressed much like school lunch rolls. 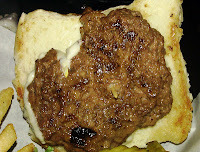 The dense mouth feel of the bun did work with the chewy, coarse beef. The buns were perfectly toasted on the same flat top upon which the burger patties were cooked. The Toppings: The tomato slices were ripe and juicy. The lettuce was shredded. I removed this and set it aside...yuck. Stop! Everyone, stop shredding the lettuce that is destined to go on cheeseburgers. It is cold, wet, and unpleasant. The Fries: Hooray--the fries were terrific. They arrived frozen, par-cooked, and bagged. Burger House crisped these fries perfectly. The fries remained crisp as they cooled, and they were properly salted. I had to fight Happy Meal to get a few of them. The Value: My burger and fries was $8.90. Happy Meal's burger was $5.90. A soda was $1.95. With tax and tip, I dropped just over 21 bucks on a couple of smallish burgers, a single order of fries, and one soda. The value wallowed in lameness. Burger House served up over-priced and well-hyped burgers. It seemed that the schtick was wild game, and that was good enough. The preparation was lackluster; the prices were high; the knowledge of the meats was meager. All that said, the premium cheeseburgers were a little above average in terms of flavor. Burger Review : Too much money for not enough burger at Burger House. The beef in the high-priced burger rose above the preparation. 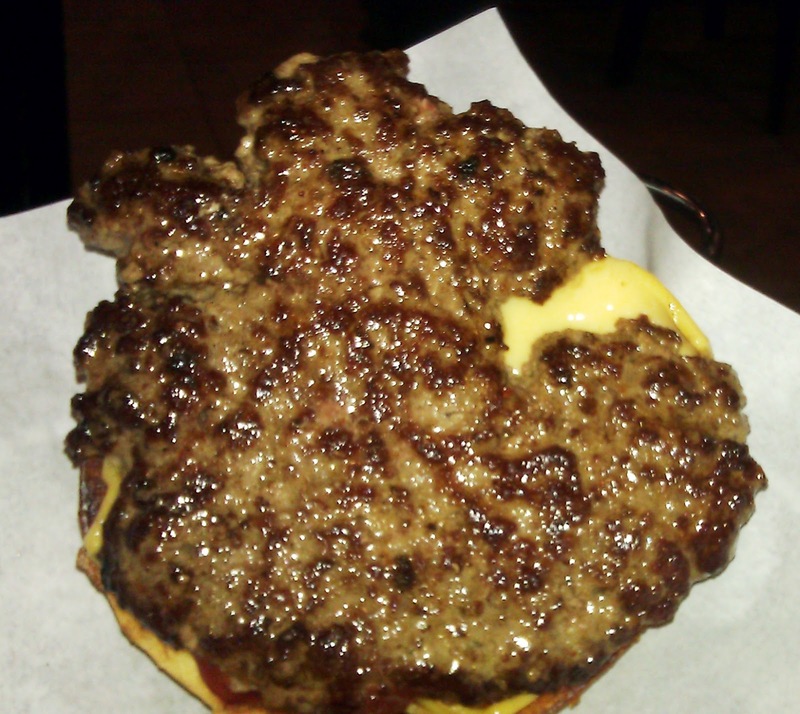 The beef in the standard burger was average and oily.